Maple View Farm Alpacas and Vermont Fiber Mill & Studio will host its annual holiday open house on November 25 and 26 from 11:00 am until 4:00 pm. 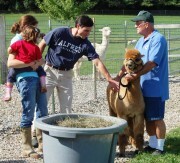 Guests are invited to learn about alpacas, raised for breeding as well as their luxurious fiber. Visit the fiber mill and see fiber demonstrations: FeltLOOM both days and hand spinning on Saturday. Then browse the farm store for great holiday gifts made from luxurious alpaca. It’s always a fun weekend!